Although not immediately aware of the transformation, Ciccio’s life changes when he finds a decades-old letter stashed between the pages of his father’s rare edition of The Golden Bough. His father, a book collector and relentless intellectual, had built a remarkable library over the years, and when he wasn’t falling into rapt discourse over some author’s literary merit, one could find him asleep in his study with a Proust volume splayed over his lap. Ciccio, too, felt the pull of literature, but his pursuits didn’t connect him with his father. He was intimidating, mysterious, and this newfound letter made matters even more complicated. Written to his father in 1931, the letter suggests the existence of a son from before he married Ciccio’s mother. A German son, born before the war. Chico Buarque’s My German Brother is a semi-autobiographical novel about family history, storytelling, and the potential for these records to fade. When he discovers the letter, Ciccio is a teenager making his own excitement by stealing neighborhood cars with a local friend. The letter changes him, and he learns to create a new kind of distraction in his head. 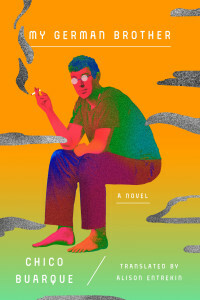 He obsesses over the possible existence of his stepbrother, and pursues a handful of leads that might miraculously connect them face-to-face. But instead of exploring hard genealogical clues or asking his parents directly about their past, he plays out scenarios in future tenses about who his brother might be and what they might do together. His obsession develops irrationally: the letter mentions a pianist named Heinz Borgart, for example, and Ciccio tracks down a local pianist named Henri Beauregard, certain that they’re the same individual. Ciccio’s search becomes a lifelong quest, with significant twentieth century events transpiring in the background of his manic daydreaming. As the years go on, My German Brother grows into a frustrating and quixotic pursuit. Many of the novel’s mysteries could have been settled with a heartfelt discussion between Ciccio and his father, but Ciccio resists, sensing that closure might shut some door between the two of them. “In my mind I run through all the fantastical ways I have imagined him since I found out that he existed,” he explains in one anticipatory scene. While this is a beautiful revelation, particularly so considering how connecting with this perhaps-mythical brother would invariably lead him to his standoffish father, it doesn’t make for a compelling novel. Much of My German Brother exists in a realm of expectant fantasy, and it is obvious early in the novel that this exciting uncertainty will outweigh whatever truth is ultimately revealed. Buarque cleverly transforms Ciccio into a storyteller with the discovery of his father’s letter, and quietly uses this as a way for him to indirectly relate to his father, a lover of stories. Unfortunately, these flights of fancy grow repetitive and aimless, and Buarque develops his novel and characters in Ciccio’s theoretical landscape, leaving little meaningful progression when the fictions clear away. Buarque is a celebrated cultural icon in Brazil, most notably as a musician (he’s released over forty albums since 1966). Fans may find the autobiographical elements of My German Brother (including photographic scans and transcriptions of his father’s letters) to be essential clues to the Chico Buarque story, but newcomers will likely find this novel flat and introspective to a fault.